It has been a while since my last skincare routine post. From the products being used to my skin type, a lot has changed. Although my last skincare worked at the time, introducing my skin to new and unfamiliar products caused my skin to have a few episodes of breakouts and reactions throughout the last few years. Through research and experiments, I managed to find a skin care routine that works with my current skin. My skin type is now normal-to-combination with concerns of acne and redness. That being said, my concern for acne and redness have slowly gone away and I am at a place where I am satisfied with how my skin looks and feels. When it comes to skincare, it is very important to me. It's crucial to take care of the skin on a daily basis, I treat my skincare regimen as "me" time and not a chore. 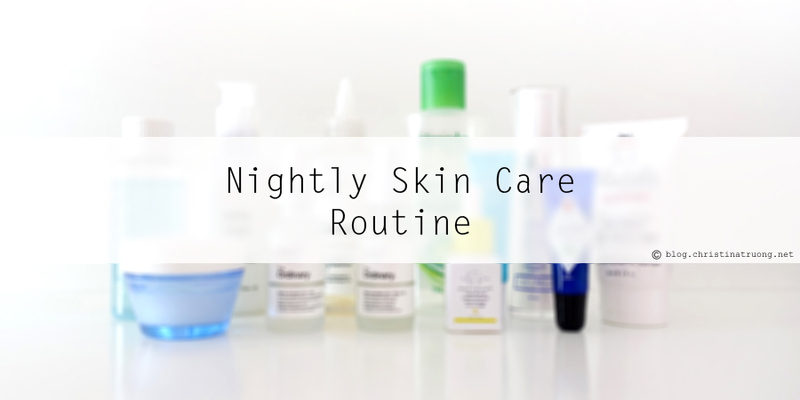 The moment I come home (and know I won't be going out again), I would immediately take off my makeup, take a shower, go through my skincare routine and slip on some comfy PJs and relax the night away! The first step in my skincare routine is to remove all the makeup on my face. If I have false lashes, I would remove those first by using a cotton swab dipped in an oil-free eye makeup remover to dissolve the lash glue, otherwise, I start off by removing my eye makeup with Virgin Coconut Oil. I take a pea-size amount of coconut oil and gently massage the oil onto closed eyes, not forgetting the brows. Next, I take a damp towel and wipe off the oil off my eyes. Then I remove my face makeup using Lipidol Cleansing Face Oil - probably the best makeup removers out there! With a quarter-size amount, I apply the oil onto the face, added a bit of water, massage, and rinse. After removing all my face makeup, I jump into the showers! Once that's done, I floss and brush my teeth and move onto the second cleanse - this is to make sure the makeup is completely removed as well as the start of the nightly skincare routine. I'm currently using and loving Glossier Milky Jelly Cleanser. I love the smooth texture the cleanser provides during and after the cleanse, bonus, my face feels clean and smooth. I splash a bit of water on my face, then use half a pump of the cleanser, massage it all over the face, rinse and pat the face with a dry towel. The next step is to tone. I alternate between two toners - The Ordinary Glycolic Acid 7% Toning Solution pH ~3.6 and Simple Cleansing Micellar Water. Because The Ordinary's Toning Solution is an acid and has exfoliation, I prefer to use it every other day. With both toners, I saturate a cotton pad and swipe it across the face and neck. They are both gentle on the face and doesn't cause any stinging. I love using serums in my skincare routine. In my previous skincare post, I mentioned a serum that I absolutely fell in love with. Unfortunately, that product was discontinued a few years ago and I couldn't find anything similar. I thought I was able to go on with my skincare without the use of serums but my skin didn't feel right. Once I discovered The Ordinary and one of the most beloved product - Niacinamide 10% + Zinc 1%, I definitely saw improvements to my skin that I haven't seen since the last drop of my previous favourite serum. Before applying Niacinamide, however, I use Alpha Arbutin 2% + HA to spot treat any acne scars on my face. Next, I apply 2-3 drops of Niacinamide onto the face and let it absorb for a minute. Then I apply a few drops of Drunk Elephant Virgin Marula Luxury Facial Oil to the palms of my hands and pat that all over the face. If there are any leftover Marula Oil left in my hands, I just run it through my hair as it helps tame frizz and adds shine. After serums and oils come creams and moisturizers. Using my ring fingers, I squeeze out a tiny amount of Neutrogena Hydro Boost Eye Gel Cream and gently tap the cream under my eyes. Then I apply one pump of Bleu Lavande Moisturizing Facial Cream all over my face and neck. Before heading to bed, I go ahead and moisturize my lips with my forever favourite Jack Black lip balm. And who doesn't love smooth hands? Any hand cream will do, I normally use L'occitane Hand Creams but I currently love moisturizing my hands with be Delectable from Cake Beauty Hand Cream, especially in Coconut & Cream. This hand cream's scent provides such a pleasant scent to go to bed with, it also nourishes my hands - making them super smooth. I am by no means an expert on any of the products mentioned nor providing guarantee perfect skin satisfaction when following my routine. Everyone's skin and skin care concerns are different. What works for me might not work for you. Know your skin, know your body - it changes from time to time. Find a store (drugstore, beauty store, specialty shops) that has a complimentary beauty consultation who will provide customize skin analysis and recommend the best method of treatment. And when browsing for skin care products, it does not hurt to ask for samples, they are the best way to find out what is best for you! One solid advice that can be said for keeping your skin feeling and looking fresh is drinking lots of water throughout the day! Disclaimer: Not Sponsored. Most products were purchased on my own. Links under this post are linked to previous blog/review posts and are not affiliate links. Products with an asterisk (*) denotes product received for consideration. Views expressed are of my own. Glossier milky jelly cleanser is my holy grail product! Glad to see you're loving it, too! Where do you buy your glossier milky jelly cleanser? I was going to ask the same question...where did you get the glossier milky jelly cleanser? I have never tried Glossier but I think I may jus do so. I love DE! Their products are top notch but I just wish they were more affordable!